There’s nothing like t-shirt shwag to get people to notice. 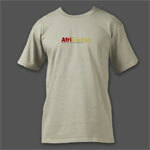 So, I’d like to point everyone towards a couple chances to get some t-shirts from AfriGadget, Muti and Afrigator. 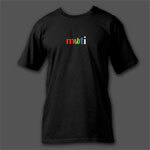 I’ve just setup a way for people to buy AfriGadget and Muti t-shirts through a store on Goodstorm. There is only a $1 markup on the shirts right now. If any money comes through the sale of these shirts, I will put it towards an African project that I deem worthy. It will go to an entrepreneur that is doing something AfriGadget-worthy. If you have ideas for who that might be, send me their story and info. 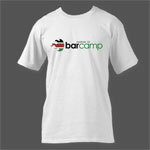 Neville has given me a couple of Muti shirts to hand out, and I brought along a few BarCamp Kenya shirts for people who attended that in Nairobi. If you’re interested, let me know. I’ll hand them out to you if you’re at the 27 Dinner in Johannesburg, or the Skunkworks/Blogger meetup on June 1 in Nairobi. Afrigator has 10 t-shirts that they’re trying to get rid of (and some iPods). Contact them and see if they will ship outside of South Africa – if you win one and are in Kenya or Tanzania, I’ll bring it for you myself. Goodstorm uses quality shirts and offers their shirts without a massive markup, which you tend to see from other shirt providers. On top of that, customer service at Goodstorm will bend over backwards to help you. When they heard that I had ordered some shirts and it was going to be close on whether I got them in time for this trip, they worked to make sure my orders were pushed to the front of the line. GREAT customer service! We will absolutely ship outside of Kenya and the 10 shirts left are available to anyone on the continent. I want BarCamp !!!! nice 🙂 I will even pay. I want one BarCamp T-Shirt Too!!!!! Note: GoodStorm.com does not currently ship outside the U.S.
argggh! I was ready with money to get one of those tshirts! We should send them an appeal! @Citygirl: pls check our AfriGadget post on it. Personally, I don’t think it’s a Kenyan invention because bike chargers have been around for very very long. Imo, there is no story.